It’s been a difficult season for Philippe Coutinho so far, as the Barcelona playmaker commented on his future at the club on Wednesday night. The 26-year-old has managed just nine goals and five assists in 40 appearances so far this season, with much more undoubtedly expected from him after his reported £142m move from Liverpool last year, as per BBC Sport. 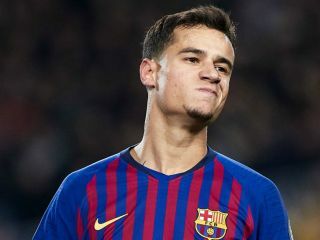 Coutinho has struggled to display the form that he showed at Anfield to earn the move to Barcelona in the first place, and that will be a concern for coach Ernesto Valverde as he’ll need more from him moving forward to emerge as a fundamental figure for the Catalan giants. Speaking after Barca’s win over Lyon in the Champions League on Wednesday night to secure their place in the quarter-finals, Coutinho gave an honest assessment of his performance levels but seemingly left the door open to a possible exit. “In the last few weeks, months even, I’ve not been playing well. But I still want to improve,” he is quoted as saying by The Mirror. Time will tell how the situation plays out, as the Brazilian international will surely feel the pressure of having to do more for Barcelona, particularly in the coming weeks and months as they remain in the hunt for a treble. Playing a key role and winning trophies could easily change the mood around his future, but as noted by The Daily Star, he has been linked with Manchester United in recent months and so it remains to be seen whether or not a return to England becomes a genuine possibility this summer if he continues to struggle.